Brooke Jarvis’ graphic: in one picture, all you need to know about climate changeâ€”and Occam’s razor. It is compelling, surely. It won’t convince someone living purposely behind an anti-fact screen. It may convince some on the fence. You have already been proven correct. Kinda funny when you think that the Sierra Club was getting $20+ million from a fossil fuel company — and that’s over four times the entire annual budget of the Heartland Institute, which gets hardly anything from fossil fuel sources and devotes the bulk of its money to non-environmental issues. The obstacle to action on climate change is not the fossil fuel industry — other industries spent just as much pushing Waxman-Markey as others did opposing it — but the fact that meaningful emission reductions with current and contemplated technologies will impose massive costs and lifestyle changes on the vast majority of Americans. Until that can be avoided, there will be no meaningful action to reduce GHG emissions in the U.S. (or, for that matter, anywhere else). A fair point: even many who agree that climate change is happening and is being driven by human activity don’t really want to change their lifestyles. That drives some of the public opposition to concrete action, I agree. Still, the RW claim that the “alarmists” are part of a great global conspiracy of leftists who want to take your FREEDUM away is the thing being skewered here. And it’s skewered well (though coal would’ve been better than oil in the graphic). The charge is absurd. You ignore the possibilities for encouraging development of new technologies without crashing the economy. To give one simple alternative – institute a carbon tax that rises in a predictable rate but that will increase in gasoline of for some reason its price otherwise falls. Subtract the money thereby raised from what a business has to contribute in social security and apply the money thereby raised to the end. 1. Research is encouraged with a relatively predictable environment concerning prices. 2. Labor is made cheaper at no cost to working Americans’ incomes. 3. As we and others become less reliant on gas they also become less tied to some of the nastiest places in the world. Military expenditures can decrease and the importance of the Middle East and Iran will diminish. Interesting that you changed the subject from who is lying to a different issue entirely. But that is what conservatives do these days. It avoids the need to actually confront issues. Pity the graphic focuses on “oil”. Coal is far more polluting (e.g. mercury) and emits more carbon dioxide than natural gas or gasoline. From extraction to burning, coal kills far more people than the nuclear industry. But somehow is has a false image of being “natural”, but it no more natural than any other fuel. China and India have turned to coal to power their industrial expansion, and that is disastrous. If we could see our way to close every coal burning plant in the world within a certain timeframe, even replacing it with natural gas, or nuclear, the world would be on a initial path to significant emissions reduction. The mining industry, which funds the denialist lobby even more strongly than the oil industry, will fight tooth and nail against it. That said, when it comes to the amount of industry *spending* on climate denialism, it seems possible that oil-producer sources (Koch et al.) actually outpace coal-producing ones, for somewhat accidental, ideological reasons. Or maybe that’s an illusion based on the fame of the Koch brothers’ spending in particular. It’s an illusion. Take the case of Heartland. Minimal Koch money, and none of it for their climate work. I believe in climate change, support a (revenue-neutral) carbon tax, and have published articles outlining other policy measures that could drive down the cost of reducing GHG emissions. The post suggested the reason we haven’t adopted meaningful climate measures is due to industry deception. My point is that is delusional. It also represents a misunderstanding of what drives climate skepticism. The folks at Heartland, etc. may be wrong on warming (as I believe they are), but they are sincere in their beliefs, as are most skeptics. And fossil fuel interests may spend substantial sums funding skeptics, but this still pales in comparison to the amount of money funding mainstream climate science and climate advocacy (e.g. the Hewlett Foundation just gave $100 million to one climate advocacy group, and that’s a single, isolated example). While the rest of the civilized world has been building efficient energy infrastructure (rail, small cars, insulation, exploiting wind/solar/geotherm sources) America has been acting like there is no tomorrow (gas guzzlers, nixing mass transit, mcmansions, urban sprawl, nixing renewables). This goes back to Reagan trashing Jimmy carter’s solar panels and energy plan. GOP solution? Just bomb brown people who are sitting on top of oil and take it. The GOP is in the climate denial business and they aren’t doing it because they really believe that crap. It’s the money! or rather THE MONEY!!! So maybe the Hewlet Foundation should give that money to a superpac ’cause that’s where the battle’s a ragin’ for the last chance for man kind. Global warming won’t destroy the planet, just civilization as we know it. That will be cold comfort for our grand children who will curse us for our failure to take responsibility and head off this avoidable disaster. The rest of the world has NOT been acting as you claim. They have been talking a lot and doing fsckall. Look at the damn numbers. The parts of the world that have made serious carbon cutbacks are basically Russia and Eastern Europe, because of the collapse of their heavy industry, and Britain because of the collapse of their coal industry (for reasons unrelated to wanting to do something about climate). There was a worldwide slight downward tick because of the great recession. That’s it. I am glad you are not a ‘skeptic’ and yes, the problems of attaining the solution are severe, but as I guess we both can see, the incentives can in fact be tweaked in powerful ways to encourage the goal we seek. What drives skepticism is ideological rigidity encouraged by money from you know who. I think ideological rigidity is the key explanatory variable. Basically, what Adler said. Maybe Grist should provide the actual numbers (rather than merely what “makes sense” a priori without examining any facts), side by side, for the funding of various organizations. It should actually give hope to know that fringe groups are indeed fringe and that rather than overcoming massive oil dollars, you just have to breach the apathy of the average American. On second thought, maybe that isn’t hopeful. What nonsense that change isn’t doable! Look at Germany, Japan, Britain, Spain, or Australia. It does mean stopping being such dreadful couch-potato wimps whining about a little expense (say a $1 a gallon tax on gasoline) and inconvenience (adapting to smart meters and domestic load management). In the single month of March 1944, US factories built 7,000 aircraft: objects of similar size and complexity to a modern wind turbine. But then, your grandfathers and grandmothers were real men. Your two success stories are Britain — which stopped coal mining for non climate related reasons, and Germany which shut down all the crappy industry in the East. I’m surprised you didn’t throw Russia in there as another “success story” but that might have been too obvious. – we can limit our numbers and all live like kings. Our numbers will be capped ANYWAY regardless of what you think — at some point — 20 billion, 50 billion, a hundred billion — there is a hard limit to the number of humans that can live on earth, regardless of how impoverished their lives may be. Once we accept that there is a limit, the obvious question then is: why set the limit at 20 billion or 10 billion or 7 billion and have most people live lives of poverty, rather than set it at something a whole lot lower and allow us all to have both rich material lives and a planet we can share with plenty of animals? 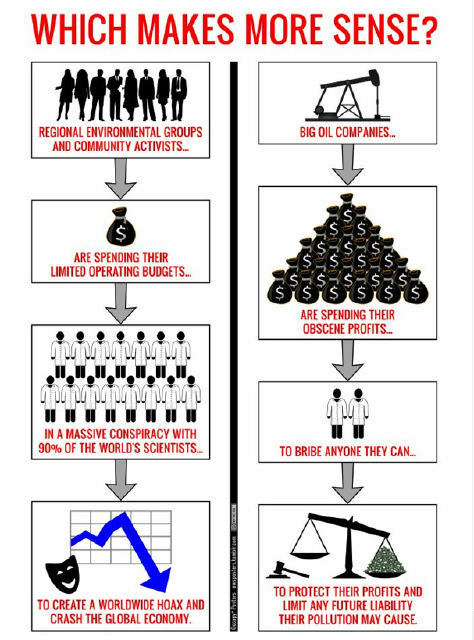 THE CLIMATE CHANGE PROBLEM (as opposed to conspiracy) EXPLAINED. There you will see two of the supposed best and brightest of our time arguing about how best to persuade people to have MORE children. You want to know why burning fossil fuel, and the resultant climate change, will continue until the human race is returned to 5000BCE — there’s your answer. Two idiots think the best solution to our current REAL problems is even higher levels of overpopulation, and apparently almost all their fellow humans agree.